One of the CDP (City Daily Photo) bloggers who showed his city of Tehran and pictures of demonstrations following the recent elections. We believe he is currently in police custody. What ever your beliefs, the freedom to take pictures and report events must be defended. Today CDP bloggers posts are dedicated to this blogger. We want him freed. 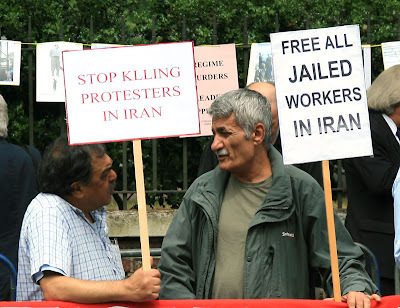 The photo above was taken outside the Iranian Embassy in London on Friday. Superb photo for today, Mo. Let's hope our voices today will give support to the Iranian people and give encouragement to Amir whilst he waits for - hopefully - early release. I like this image of peaceful conversation, Mo. It is what we wish for around the world, especially during this time of peril for communities within Iran. I am so glad that you have chosen to participate in this special Theme Day. I hope that our missing blogger will be able to participate in our next Theme Day. I hope Amir and all others in similar plights will be treated well and released without charge. We are so lucky to have freedom of speech, of the press, of religion in the UK. The placards say it all and the exchange of looks between the two peaceful protesters is so powerful. Excellent text too, we are all one voice today. There are some news regarding 'A' being set free tonight. But I will not post them until their friends speak to him in person. Nicely done, Mo. The photo tells the tale, and your commentary puts it all together! Excellent shot, it says it all, in a peacefull way. Without freedom of the press and freedom of speech none of us are truly free. Hi Mo, our photos are a small step in bringing the world closer together ... the photos "A" has shared are the perfect example ... thanks for your post. Perfect post for today's theme and all our hopes for our fellow blogger. Congratulations on your 500th post. Great job! An excellent shot of free and peaceful communication. Thank you for this post. I love your choice for the photo. I hope he knows that there are people who are wanting him free and safe. Good choice, great shot ! «Louis» was pleased to learn this evening that Amir has been released. I'm glad for your support. I'd like to make you aware of this video. Jump to 00:27:10 if you don't like to watch the whole video. I think this is what most western countries deny but it is all connected. This whole situation is saddening.